Just a few more days until we reach my favorite holiday, New Year’s Eve! I’m a New Year’s nerd and love the feeling of a clean slate that the change of the calendar brings. And then of course there’s the literal change of the calendar — my husband got me the cutest Sugar Paper planner for a Christmas gift! Not to mention the sparkly, metallic party decor and champagne bottle popping that comes with this particular holiday. New Year’s Eve, tucked in a week after Christmas, can be a scramble to prepare for and I always find myself searching last minute for the party decor details I need for my annual celebration. This year, just a week out from my due date, we’re hosting a small dinner party. To help prep, I thought I’d share some of my favorite last-minute resources for the best festive New Year’s Eve party supplies: Amazon. The best thing about Amazon is that you can wait until the last minute to order and the supplies will still get here in time! I’ve found some awesome balloons for New Years, a variety of tassel garlands for my bar cart, and tons of cute straws, flatware, and paper goods. There can be so much to sort through so I usually start my search with a brand I love called Meri Meri, and then dig my way through related products from there. Target. 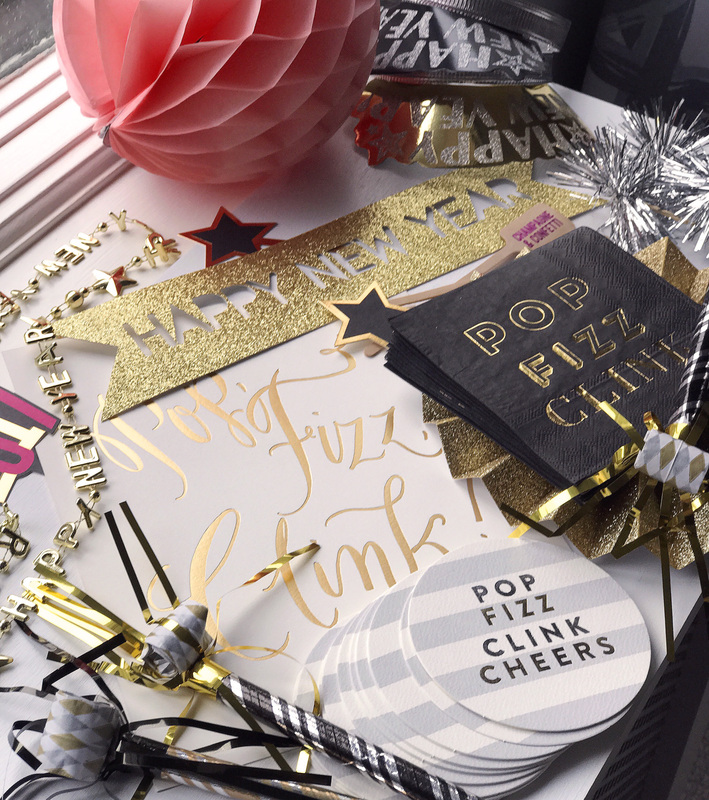 I love to scope out the New Year’s supplies that Target designs each year, they always have a new party goods collection with cute options for party hats, plastic champagne flutes, and fun party crackers. Selection can sometimes be limited in stores, so I check out what the collection looks like online and do their buy-online and pick up in-store option to make sure I get the best pieces! Paper Source. This store is absolutely addictive for paper-lovers and party-supply hoarders like myself! They’ve expanded their party supply collection quite a bit and I pop in to pick up confetti poppers, smart cocktail napkins, sparkly banners, and a great selection of decorative paper rosettes and honeycomb balls. Home Goods. I rarely need another excuse to go to Home Goods, but their party supply section has been yet one more reason to pop in and explore their treasures! I got most of my New Year’s Eve supplies from there this year after scouring the wrapping and paper goods aisle. It takes some digging but it’s so worth it for really unique pieces. I can’t wait to feature some fun coasters and napkins and banners at our dinner party from my haul! Holiday Baking with PeaPod. 2017: Year Of The Hustle.